What used to be the gamekeepers dwelling lies on the edge of the Pietrafitta hamlet and overlooks the pool and the surrounding rolling hills covered in woods and olive groves. The floor above used to house the hamlets school, today it can also be rented by the week. You enter the Casa del Guardia over the small piazzetta shared with the house Pera. 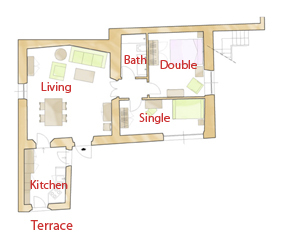 The large living room is the center of the holiday apartment. The kitchen opens onto a private terrace for outdoor meals. One double and one single bedroom share a bathroom.